One of the sad ironies of being a busy web designer is that you make time for everyone’s website – except your own. So it stands to reason that many of us could use a little head start when developing our own business sites. Certainly, a WordPress theme can do just that. While you may be thinking, “I’m a designer, I don’t need to use a theme…” try to think of this in a different light. A theme can be a great launching point for your site building process. Find one that has features that will make your life easier – and then customize it to suit your specific needs. So, while all the themes in this collection will look great with a default setup, they also offer you the power to add your own mark. You’ll be able to change various settings through the WordPress Customizer or through a bundled page builder. If you want to take things even further, create a child theme and make changes to both templates and CSS. Smoothly is a portfolio-style theme that includes six unique concepts. The looks are all quite stylish with features like video backgrounds and on-scroll animations. There is lots of functionality via a vast collection of bundled plugins – including several exclusives. The bundle covers things like Google Maps, social sharing, filterable post grids, along with ways to display your portfolio and team members. Visual Composer is added for easy page layout creation. You’ll also find an included child theme to allow for advanced customizations. 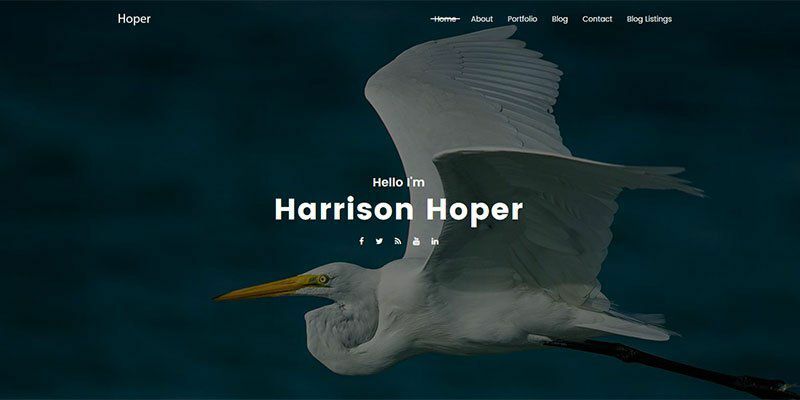 Hoper provides a simple and attractive theme that can serve as a vehicle for your online portfolio. Use it as either a single-page or multi-page site. Based on Bootstrap, the theme can be customized through the Redux framework and the Unyson page builder. A filterable portfolio is included to display your work in style. The overall look and functionality are exquisite. As the name may suggest, Minify is a minimally-styled WordPress theme. The result is a look that makes content quite easy to digest. It utilizes Bootstrap, which provides both a solid foundation and an opportunity for customization. There are a variety of home page, header, portfolio and blog layouts to choose from. Under the hood, you’ll find well-commented code to help guide you in making tweaks. Visual Composer is also included. Ana is a cool and modern theme aimed at creative professionals and agencies. It sports multiple demo site variants, six home page layouts, two types of navigation and six single portfolio styles. The included AJAX page transitions provide a unique way to keep visitors engaged. There are lots of settings available to tweak in the WordPress Customizer. The package includes a copy of Visual Composer. Mochito is a slick, one-page theme that utilizes AJAX for smooth scrolling and some excellent animation. You’ll find a hero image area that can display as a standard rectangle or take on a variety of attention-getting shapes. Or, take it full-height to really wow your visitors. You’ll also find a copy of Visual Composer, custom Shortcodes, multiple page templates and Google Maps integration. Your business is different, and so is Eurybia. It’s clean, but with a side of dark and disturbed mixed in for good measure. There are some nice touches added in, like multi-column mega menus, smooth scrolling, lots of grid styles and some really attractive WooCommerce product layouts. It uses the Redux framework and a copy of the ubiquitous Visual Composer is bundled in. If you really want your work to be front and center, check out Minimus. 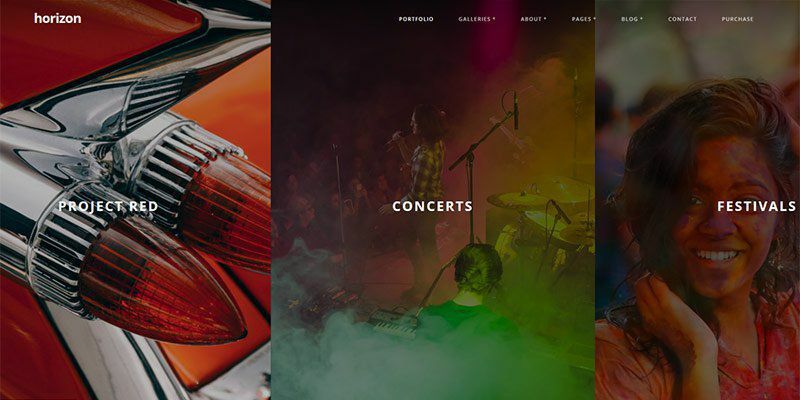 While the theme includes four demo home pages, the full-width “Portfolio Showcase” is a great choice for designers who want their portfolio to do all the talking. Bundled plugins include Essential Grid, Slider Revolution and Visual Composer. Also check out the variety of menu styles, custom Shortcodes and parallax scrolling. Gravity aims to focus on typography, usability and UX. From the looks of things, they hit the mark. The layouts are pixel perfect and text is very easy to read. The smooth scrolling animations make for an elegant experience. Included are copies of the Slider Revolution and Visual Composer plugins, along with an advanced portfolio system. Show off your artistic side with Dieter. It includes several customizable layout options, various headers and a mega menu. The theme can be used for landing pages or full-blown multi-page websites. There are a large collection of custom Shortcodes for adding design and functionality features. Overall, the design’s use of whitespace and color bring a very modern and appealing look. Copies of Slider Revolution and Visual Composer plugins are included. Horizon features a horizontal slider/portfolio that will certainly get a users’ attention. With large, muted photos and bold typography, you’re sure to get your message across. Also included are some lovely page transitions, multiple blog layouts (including a really nice masonry grid) and optimization for touch-enabled devices. Quite a unique theme compared to the usual portfolio fare. While finding the time to take care of your own website may be difficult, it’s vitally important. The types of design work clients look for changes with the times. You certainly don’t want them looking at an outdated site. The themes showcased above will give you the opportunity to start fresh while saving you some time. Your business will be better for it.